When I was pregnant, my husband and I found out we were having a boy. I told him we should decorate the nursery with an airplane theme. My husband immediately said, "Well if that's the case, we have to name him Maverick!" So, Maverick is now 9 months old and is the most amazing kid ever!! This was his first Halloween and I told my husband that he needed to build a jet for his costume and I would take care of the wardrobe. 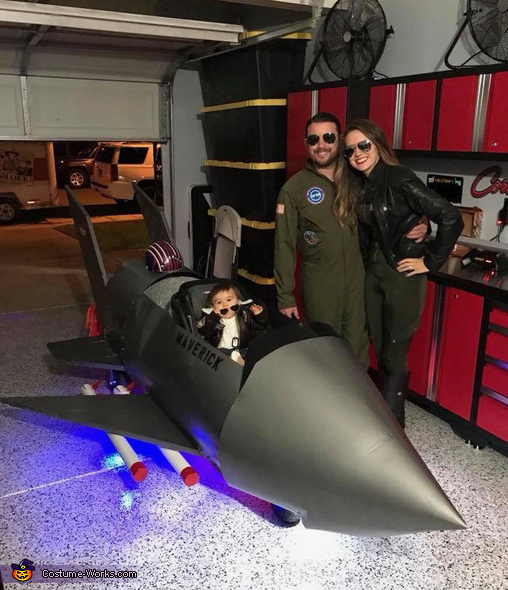 :) My husband took 3 weeks off from work for paternity leave and to build Maverick's jet just in time for his first Halloween! F-14 Tomcat Fighter Jet - Plywood on 10in caster wheels, body made out of aluminum flashing, Flight Control Board made out of plywood, red toggle switches, battery operated LED lights, with light up automotive gauges, Fans with lights placed in engine tubes to simulate flames with red and orange tissue paper attached to the engine tubes, Uppababy car seat mounted forward facing to the floor, extendable pole screwed into the floor for the joystick handle, top gun and naval roundel decals added to side of body and fins, Maverick spray painted on side of body, UE Boom speakers mounted inside front and back of body (hidden) to play Top Gun theme music in the front and jet sounds in the back, Navy spray painted with stencils on body, entire jet was painted with a textured "hammered" gray spray paint, Red, Blue, and white battery operated light up flashing road flares were mounted under each wing and under the front wheel landing gear. We posted on Facebook and the response was overwhelming. Maverick had so much fun and he loved hanging out with friends and family on Halloween. Everyone thought the jet was absolutely amazing and that our little man, Maverick, was in the PERFECT costume! While we were pushing him around the neighborhood every was stopping and asking where we got the jet and how cute Maverick was. We had a few folks say, "Mom and Dad of the year" but what we were thinking was how special Maverick is to us and how these memories will be so great to continue to share with him and others. My husband plans on working with Maverick as he grows up to add a real gasoline engine to the jet so they have a continued project to work on together. A few folks recommended us enter Maverick into the contest. We thought it would be a great idea and decided on a great plan! If Maverick wins the contest, we will be placing money into his college fund so he will be guaranteed a great college education.